Perfect weight for me as I use a heated mattress pad as well. The down doesn't shift, but flattens out when you sit on top of the comforter (as expected it would). Shake it out and it fluffs back up. For the price paid, it was well worth buying. Snuggle up and enjoy a luxurious night's sleep with this Hotel Madison down comforter. Filled with natural down and covered with soft cotton, the comforter is plush and warm, providing a cozy sleeping experience year-round. The comforter is available in a variety of rich colors to complement your decor, and the 15-inch box stitch construction ensures an even distribution of down. Another UPDATE: I have now ordered 5 of these in various colors. They are so great that every bed in the house needs one. The indigo is beautiful. The lighter blue is lovely. The chocolate color has marked purple hues ... very purplish. Not a good look for a chocolate comforter. Update AFTER 3 MONTHS OF DAILY USE: 5 STARS. These have been washed no less than 12 times and still perfect as new. No wrinkling, perfectly comfortable in 50 degrees and now in 0 degrees. LOVE the idea of having a down comforter that needs no duvet is very appealing and options are few. So, these work. I bought 2 in navy (well, they are navy but they were called "indigo" in the product description). have already washed and dried them twice. the wash amazingly well and don't shed down. They don't wrinkle either. The do have a slightly "crunchy" outer fabric but I don't mind that at all ... sort of like it actually as it sounds/feels like starched linens. I do not find the down to be uneven, especially after machine washing and drying. What I do find is that these are heavier and fluffier than I hoped for. Based on the other reviews, I expected more of a down blanket thickness but, nope, these are comforters. Even in our cold climate, it's just a bit much for me. But, they are nice. Note that the navy/indigo is considerably darker than is shown on my screen anyway. Awesome color and perfect weight for year round... very happy with this! Even though it's lightweight, this comforter is very warm. We use it as a lap blanket while binge watching TV in the evenings. When it first arrived we almost sent it back because it looked too shiny and didn't seem to have much down filling, but after ONE washing (in the machine) and drying in the drier (on low then air dry over the railing in the upstairs landing) the shine was GONE and the down all fluffed up and sumptuous. The color is beautiful, too. I love the color of this comforter! It is so difficult to find a real down comforter that isn't white in color. I personally don't like the hassle of a duvet cover and find that the white comforters always need one. White comforters tend to discolor from being touched along the edge. I don't know if it's hand lotion or face moisturizer, but it seems impossible to prevent or eliminate. This comforter is fine in the winter and in the warmer months, I like to "sleep cool" with the AC. It has been my favorite down comforter in a long time! 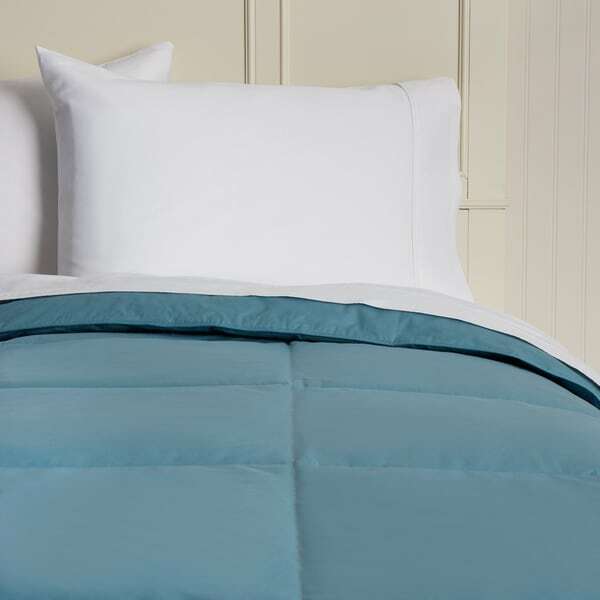 , Perfect lightweight comforter with a very soft and sumptuous cover. The color is beautiful and as shown, and the fill is just the right amount. My daughter loves it! This comforter looks and feels great. The color is true to the picture and is a beautiful medium blue. The fabric is soft and has a nice polished looking finish, like sateen. The weight is perfect and not too heavy. The down is evenly distributed and consistent across the entire comforter. The size fits my king bed perfectly. I searched for quite a while to find the "perfect" down blanket that I could use without a cover. This one fits the bill perfectly. The color is a lovely sea blue color- not merely a pale blue. The weight is exactly what we needed and the fill is uniform. It was a bit crunchy when it first arrived, but that has settled down nicely and softened after only a few months. I have wanted a down comfortor for years and just found them way too expensive and always in white. When I saw this king size comforter came in colors and was only $**** I was thrilled. Love it, love it, love it. Its well made, comfortable and looks good in my bedroom. I highly recommend this item. This is the down comforter I hoped for. It's light and fluffy. I especially like the color. Dark blue in a down comforter is very hard to find. WOW!! VERY soft! Washed like a rag! I absolutely love my comforter. Not to warm and not to cold! It is the perfect weight for ALL seasons and the color is fabulous. great quality, but a bit heavier than I expected. It was described as "down" but not...alternative filling and it was packaged VERY poorly-I sent it right back. This comforter is the perfect weight for me (I live in Texas). It keeps me warm without overheating. Was a little "crisp" at first but after washing has softened up. Nice quality and was what I expected. "What does the fabric feel like? " Its a good quality cotton, not scratchy. However I have mine is a duvet to keep it clean since I have a small dog. But I would definitely recommend it. I live in South Florida and it is not suffocating and comes in gr8 colors. Like a plastic tarp. I'm not kidding! Such a disappointment. "Does this product have ties?" I Only like natural items, so my choice for bedding is DOWN. Just like REAL leather for shoes and jackets (not petroleum derived pleather or vinyl). But the biggest deal makers for me is that it comes in RICH colors,(not pastels), an affordable price, and to top it off, I believe it's made in the Great USA! "What are dimensions of king??" The King is 104 x 89. The Full and Queen are both 88 x 90.